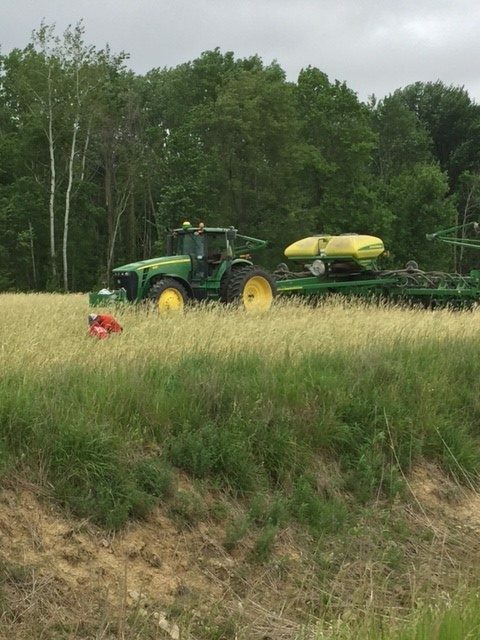 Photo: Planting seeds into cover crops on Carla Schultz’s Michigan farm. Carla Schultz and her family raise soybeans, corn, pigs, beef cattle, alfalfa, black and navy beans, and wheat on their Michigan farm. Just like any business, my husband and I know we need to continue to learn and try new things to grow and build our farm for the future. Each growing season, we devote areas of our farm to testing new products and ways of growing our crops. We share our results with other farmers and talk with them about their experiences to help make decisions about what’s best for our farm. All of this takes time, but it’s something we love to do, and we know it helps us be more sustainable. One area we’re particularly interested in researching and learning more about for our farm is the use of cover crops. We plant cover crops on about 80 percent of the area that we farm, and constantly test different types and ways of growing cover crops for each of our fields. We plant cover crops after our regular crops are harvested. We have learned a lot since we planted our first cover crops. In the past we have planted them in the fall, but this year we planted them in the spring before we planted our regular crops. While we don’t harvest and market cover crops like we do our traditional crops, they bring significant benefits to the environment and our farm by helping prevent erosion and improve soil and water quality. Pounding rain and high winds are common in our area and can erode the land, but our cover crops help hold the soil in place, protecting it from water and wind. Keeping the soil covered also minimizes weed growth in our fields, reduces water loss from evaporation and helps maintain a more constant soil temperature. Even more exciting is what is going on below the surface. When cover crops decompose, they release rich, nutrient-filled organic matter in the soil. This helps feed the crop we’ll plant in the soil the next season. Cover crops are just one tool we use to sustainably grow crops while protecting our land and water for future generations. While there is no shortage of things to manage on our farm, we will always make it a top priority to test, learn and implement tools that can help us be more sustainable. Want to learn more? You can visit the CommonGround website to learn how other farmers are using cover crops and other tools to be more sustainable on their farms every day.